I've chosen to right the walkthrough for Lorelei from the perspective of entering through the West Gate, so directions will be given as if you started there. Just north of the West Gate is Lewis's Store. Lewis sells horses for 600 coins. The horses themselves are located just south of the gate. South of the horses is a small park or garden. Start looking here for Sandra, if you didn't already find her in Shamirik. She's wearing a brown and yellow dress, and has red hair, if that helps you to locate her. I most often find her in the park itself, but she could be anywhere outside in Lorelei. East of the garden is an Anama temple. You can't enter the temple without Anama rings, either real ones from joining the Anama church, or fake ones, which can be bought here in Lorelei. Either way, you'll want to get into the church, as this is where you'll find Mundt, the object of the quest from Mother Melamed of Kuper. At the end of the street running north/south just east of the Anama temple is a pair of doors leading to the southwest section of the inner wall. The next building to the east is the inn. It's run by Winterhouse. Ask him if he's heard any interesting rumors and he'll tell you he has, and that he'll give it to you for 50 coins. Pay him the coins and take note of what he says. He'll tell you to go talk to Randall, the item salesman, so when you get to Randall remember to ask him about the rumor. The next building to the east, on the other side of the South Gate are two empty shops. Across the street to the east from these shops is a block of apartments. The two western ones aren't that important, but the one to the west is very important. Entering the apartment you'll notice the sun symbol of Avernum. Go to the southeast corner of the room and look for the hidden passage. Once you're in the passage go down to the bloodstains on the floor and through another secret door into a concealed room. The man sitting here is Dwaine, and he has quite a bit of information for you. Once you're done with Dwaine exit his apartment and go through the doors to the west. This takes you into the southeast section of the inner wall. Go back into town and check out the building just to the north of Dwaine's apartment. The westernmost of these two shops is the training center for Lorelei, which is run by Yukiko. Next door to Yukiko is Carson. Carson sells weapons, but more importantly, he provides training in the Barter skill. Across the street to the west from these shops is the Internal Affairs office, which is run by Lyle. Lyle is the job dispatcher, and he'll also sell you Hawke's Manse, in the northwest corner of town, for 8000 coins. Once you've talked to Randall about the rumor from Winterhouse he'll send you to talk to Lyle. 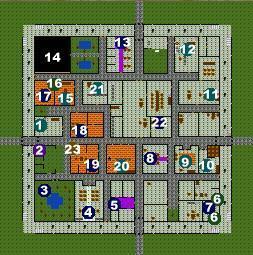 Lyle in turn will tell you you need to speak to Foxfire, who wanders the smaller towns in Midori Province. Make sure to buy Foxfire's secret when you see her, because it might take a while to find her again. The building just to the north of the East Gate are two more apartments, and just north of that is the University. Unfortunately the University is not providing any teaching right now, but Carlos, the teacher there will sell some alchemical recipes. Just to the north of the university is Gertrude's Shop. Gertrude is the armorsmith for Lorelei, and she has some pretty decent items. The road next to the armorsmith ends in the doors which lead to the northeastern section of the inner wall. This section is worthy of note because it contains a cell with a Giant in it. The Giant isn't hostile, but it doesn't want to talk to you either. The building just across from the armorsmith is where the residents of Lorelei apparently keep their cows. Feel free to go commune with them for a while. I sometimes let them out of their pen just because I think it's funny to see a couple cows wandering around the town. I once found one all the way over by the horses after doing that. Just to the west of the North Gate is the mayor's office. The mayor in Lorelei is Bruette, and she's pretty useless. She'll give you a quest to find a way into Blackcrag Fortress, but she isn't doing anything to deal with the Giants, since she doesn't want to interfere with what the Empress may have planned. The roadway just west of the mayor's office ends in the doors leading to the northwest section of the inner wall. Next to the mayor's office is the coutryard to Hawke's Manse, and Hawke's Manse itself. If you bought it from Lyle you can enter and explore a bit if you want. There's a walkthrough under the Midori section for Hawke's Manse. To the south of Hawke's Manse, against the western wall is Kendra's shop. This is who you're supposed to deliver the package from Irvine to. Once you've delivered the package Kendra will let you enter the Thieves Guild. Kenra also sells gloves. The Thieves Guild entrance is in the northwest corner of Kendra's shop. Sitting in the middle of the room is Geoffrey. He'll do many things for you, but they all come with a fairly hefty price. All in all, Lorelei is probably one of the most expensive cities you'll visit. For 2500 coins he'll sell you a set of fake Anama rings, for 3000 coins he'll give you permission to pass through a secret passage to Blackcrag Fortress, and for, I believe, 1000 coins he'll tell you where you can find treasure all through Valorim. He also sells a few items, which you might want to take a look at. Just west of Kendra's shop is Randall's shop. Remember to ask him about the rumor you got from Winterhouse, and he'll send you to talk to Lyle in Internal Affairs. Randall sells a variety of items, which are definitely worth looking at, including a Blessed Longsword. South from Randall's shop is someone's house. There's some halfway decent items scattered around, which you might want to pick up. Just south of that house is the Lorelei Library. The library is run by Yessenia, who sells maps of Midori and identifies items. Yessenia will tell you about a book in the northwest corner of the library once you've completed the Troglodyte/Giant quest. This book teaches Return Life Lv.3. East of the library is the food shop, which is run by Ligaya. All she sells is meat...birds, in particular. The last remaining block is the barracks for Lorelei. In the southeast corner of the barracks block is Commander Bruskrud's office. You'll get two quests from her. First she'll ask you to recover some soldier's possessions which the Giants have kept, and then, if you ask her if there's any other quests, she'll ask you to free some prisoners from the Giant's Cave. Now that you have your quest, it's time to head off to the Giant's Caves, which are to the southeast of Lorelei. Just hug the mountains and you can't miss them.